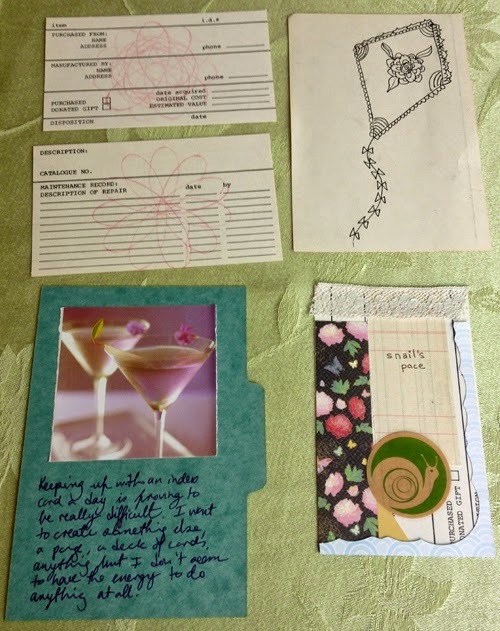 Here are my cards from week 2 of the ICAD (Index Card a Day) challenge. The top three cards were done at work -- two using a freebie Spirograph from Rubio's that they apparently gave away back in the day (they were in my co-worker's desk which she was cleaning up, so I got one) with the red pencil that goes with. It was easier to use than the actual spirograph that I have. The bottom two were done at home. One journaling how I'm feeling about the challenge (the martini is kind of relevant) and the other putting together snippets of stuff that were littering my desk. That's the good news. The bad news is I haven't done any cards this week. But I can always start again today.